Summary: Great place to spend the day. Food is fine but hardly inspired. Sunday morning rolled around, January 16, and the temperature was in the 80s. The hardships of Southern California — so what to do? Go to the beach! 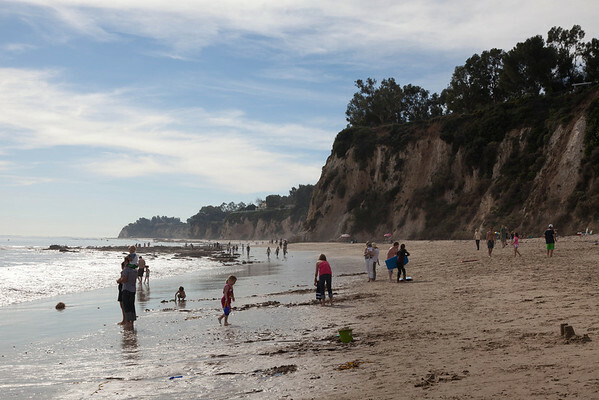 We headed up the Malibu coast to Paradise Cove. 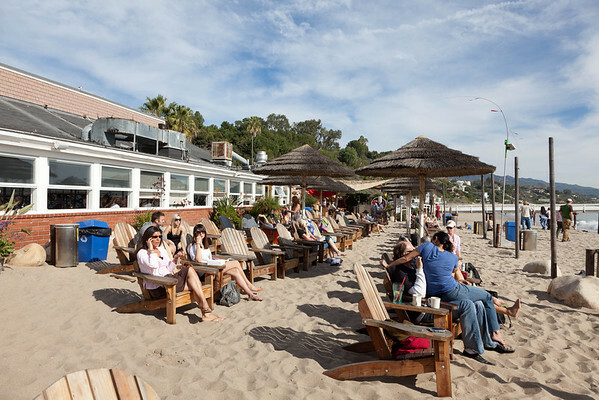 This joint isn’t my usual fare food wise, but they are superbly located in a quant beachy cove in Malibu, and they have tables on the beach and public chaises on the sand. A word of warning: if you go on a nice day, be prepared to wait. Sometimes as much as two hours for an outside table! 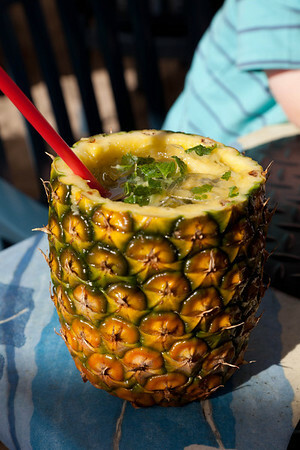 “Pineapple, Tequila, Mojito.” Gimmicky, yes. Tasty yes. I did wish the “glass” was bigger, really not that much volume had been hollowed out. 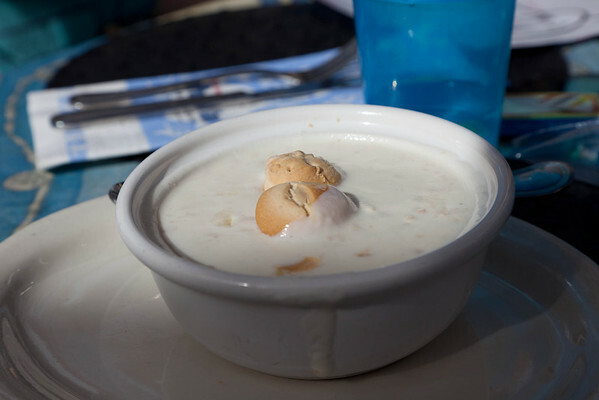 “New England Clam Chowder.” I was a sucker for Clam Chowder long before I went to Boston for grad school, and I still am. This was a respectable contender in the arena. Not amazing, but lots of cream and butter. 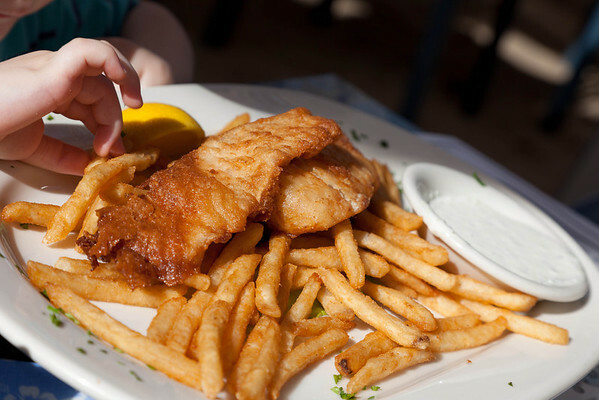 “Fish and Chips,” for the boy (2 years old). He was highly preferential to the chips. 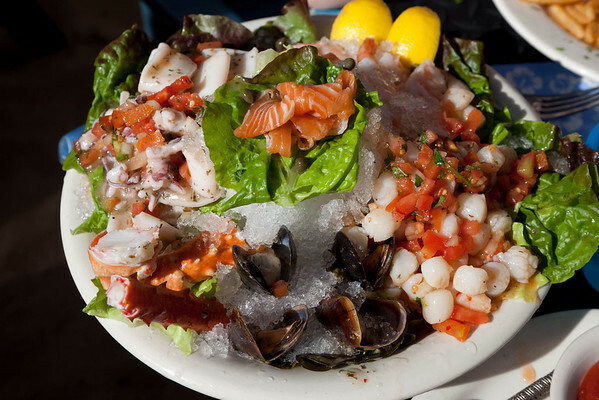 “Iced Seafood Sampler.” This was me. The concept is good, the execution wasn’t perfect. Certainly edible, and the fish was fresh. It was soaked fairly liberally in what seemed to be Italian dressing — not sure what I thought of that — and it isn’t the most exciting specimens. Small scallops, frozen king crab, octopus. Still, I enjoyed it. 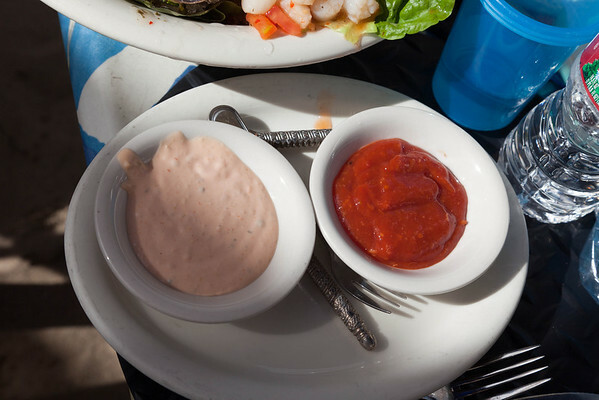 Cocktail sauce and louis dressing. 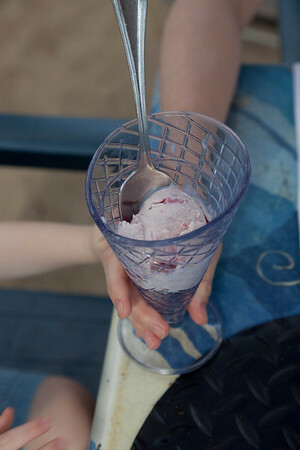 “Strawberry ice-cream,” came with the kid’s fish and chips. My son was much appreciative. This is what you really come for. Umbrellaed and available chaise chairs. 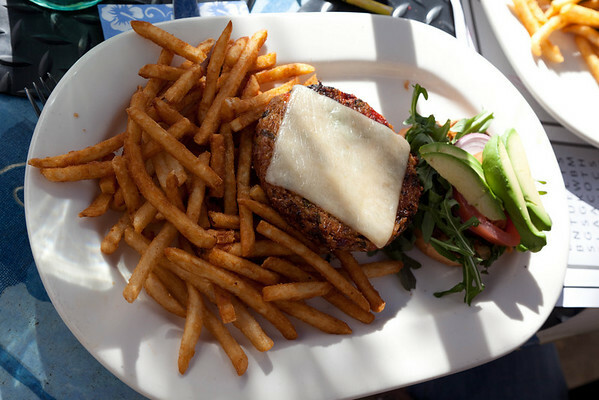 This entry was posted in Food and tagged Brunch, Clam, Clam chowder, Cooking, Dessert, Fish and Chips, Food, Ice cream, Malibu California, Mojito, New England, Paradise Cove, Restaurant, Restaurant Review, reviews, side dish, Southern California, vegetarian, veggie burger.